4th of July Sale! 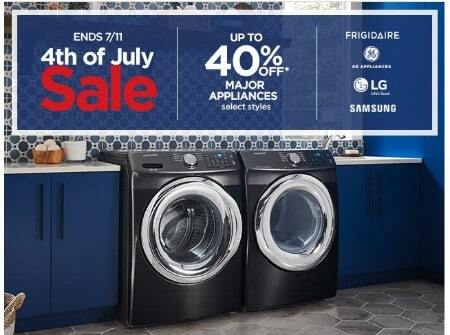 Shop in store and take up to 40% off major appliances. *GE, GE Profile, GE Café, & Haier limited to 10% off savings. Items are subject to availability. “Original” and “regular” prices are offering prices that may not have resulted in sales, and intermediate markdowns may have been taken. Prices not effective in closing JCPenney stores. JCPenney reserves the right to limit returns or exchanges without a valid receipt. “Sale” events exclude Best Value merchandise.